NOTE from DearMYRTLE: The following was received from our friends at the New England Historical and Genealogical Society. The New England Historic Genealogical Society is pleased to announce that the 2017 Books + Gifts Catalog is now available online! Newly updated, the catalog features publications released during the past year and highlights upcoming titles that will be available in the coming months. The online version is fully linked to products within our store. New works by NEHGS staff cover everything from Irish research to study project compilations to advice on creating a bibliography. A table of contents allows you to find books in your favorite categories - Portable Genealogists, the Great Migration, regional resources, writing guides, and more - and an index enables you to look up books by title. 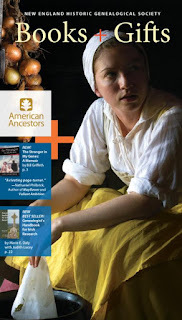 The cover photo was taken by NEHGS Director of Digital Strategy Claire Vail at Plimoth Plantation last year. The image portrays Alice Bradford (Governor Bradford’s second wife) represented by Kyle Damron.